Cardinal Collins and Cardinal Sarah with USMC students. Every time the gates to Elmsley Place open, passers-by invariably gather in the hope of catching sight of the important person visiting campus. On the morning of March 12, two cars pulled up in front of Founders House, and USMC Chancellor Cardinal Thomas Collins disembarked. In his company was Cardinal Robert Sarah, prefect of the Congregation for Divine Worship and the Discipline of the Sacraments and one of the most important figures in the Catholic Church today. 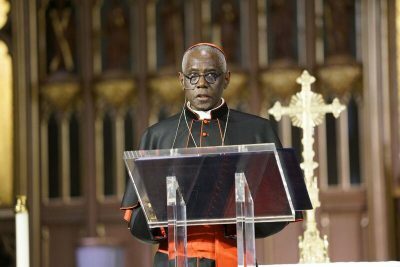 Cardinal Sarah grew up in the West African nation of Guinea as the only child of parents who converted to Catholicism thanks to the efforts of the Holy Ghost Fathers, or Spiritans, who came to Guinea as missionaries early in the 20th century. He entered minor seminary at age 11, and Saint John Paul II appointed him Archbishop in Conakry at age 34 to fill a post made vacant by his predecessor’s imprisonment; his appointment made him the youngest archbishop in the world at the time. He presided over the Catholic Church in Guinea under a Marxist dictatorship that was later replaced by a military junta. With church properties in the hands of an oppressive revolutionary government—one that suspected his faith of having counterrevolutionary potential—the young archbishop faced destitution on one hand and political imprisonment or death on the other, a balance that would remain in place as long as he stayed in the country. Cardinal Sarah listens during vespers. In 2001, he became secretary of the Congregation for the Evangelization of Peoples, at which point the 56-year-old left Guinea for the Vatican, where he has lived and served in various capacities since. 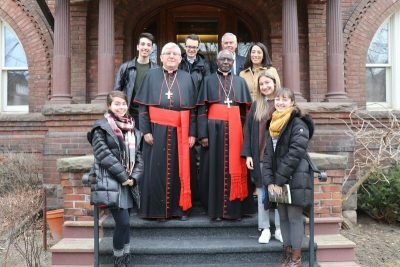 On March 12, visiting Canada with his personal secretary, Cardinal Sarah stepped onto the stones of Elmsley Place under a gentle snowfall. He entered Founders House to meet with President Mulroney and a number of St. Michael’s students, at least one of whom brought a book for him to sign: The Power of Silence. This is the cardinal’s most recent book, and its central theme—the necessity of silence for the cultivation of an inner life and an ability to know God—found its way into his conversation with students, his comments in a subsequent interview, and in the address he delivered later in the evening at St. Michael’s Cathedral Basilica. 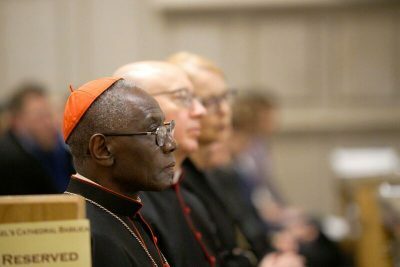 Silence, Cardinal Sarah said in an interview on campus, is often misunderstood. “Silence is not only not talking;” it is “[deeper] than that,” because “the great noise is inside ourselves.” Discovering God requires the sort of inner silence that forces a person to encounter himself or herself without distraction. “God is silent,” and if someone wants to “listen to God, you must keep silent.” After this encounter with one’s self and with God, it becomes possible to encounter others. Cardinal Sarah genuflects before his address. Cardinal Sarah left campus with Cardinal Collins in the early afternoon to prepare for the evening program. He met more St. Michael’s students as well as a number of USMC professors at a reception and dinner before joining a gathering of over 1,200 people in St. Michael’s Cathedral Basilica for vespers and a public lecture at 7:00 p.m. After Cardinal Collins concluded vespers, Cardinal Sarah genuflected before the tabernacle for several seconds before standing in front of a clear plexiglass podium and opening his notebook. Thousands of people from around the world watched a live stream of the talk that followed. He began with the motto of the University of St. Michael’s College and of the congregation that shepherded the school into its existence, the Basilians: “Teach me goodness, discipline, and knowledge.” Cardinal Sarah then described how it is possible to develop these virtues in oneself, with reference to Elijah’s encounter with God at Mt. Horeb, recorded in 1 Kings 19. In that story, God is not in the earthquake, fire, or strong winds, but instead appears in the “still, small voice” to which the prophet immediately responds. Cardinal Sarah delivers his remarks. The cardinal warned against giving oneself over to ephemeral things for fear of coming to “understand ourselves to be ephemeral and insignificant.” Technology is only ever a means, and must not allow us to lose sight of the dignity of the human person or the eternal worth of our lives. “The noise of the heart passes like the noise of the world. The silence of the heart is eternal,” he said. By reconsidering our approaches to prayer and the liturgy, it is possible to discern the “sonorous thread of silence through which God speaks to us,” he said, with reference to remarks of Pope Francis. 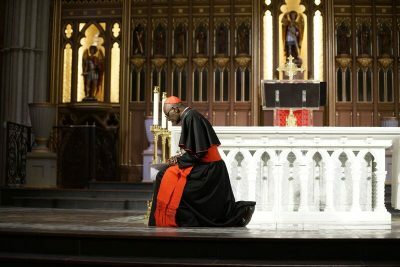 In front of a rapt audience, Cardinal Sarah closed by offer his prayers for those in attendance while also soliciting their prayers for him, “that we may together fulfill this awesome task and rest together in the awesome silence of God.” The quiet in the room was then broken by applause. Martyn Wendell Jones is a writer in the Office of Communications at USMC.